Google’s AlphaGo computer may have bested a human in four out of five matches last month, but human beings still excel when it comes to intuitive leaps in problem solving. That’s the conclusion of a new paper in Nature by Danish scientists. Blending the two approaches yields the best of both worlds—a marriage of man and machine. Even better: the researchers made this surprising discovery by getting people to play online games. A few years ago, Jacob Sherson, a physicist at Denmark’s Aarhus University, was frustrated by the challenges of building a working quantum computer. While listening to his favorite radio program as he biked to work one morning, he heard about the notion of gamification: crowd-sourcing difficult problems by letting members of the public play games designed to come up with the best solutions. “Why not gamify these complicated problems and ask players all around the world to help us?” Sherson reasoned—with no advance knowledge of quantum mechanics required. And in 2012, Quantum Moves was born. Unlike a classical computer, with bits representing 0's and 1's, a quantum computer stores information in “qubits.” Thanks to the weirdness of quantum mechanics, such a qubit can be in two states at once, both 0 and 1, just like Schroedinger’s cat is simultaneously alive and dead until a measurement or observation is made. It’s called a superposition of states. There are many proposed methods for building a quantum computer, but most share a common challenge: the quantum information must be shielded from all external noise in the surrounding environment. The slightest bit of interference—a single photon bumping into the atom you’ve used to encode and store your information, for instance—will cause the entire system to “decohere,” such that the all-important superposition that lets your qubit be both 0 and 1 at the same time is lost. That means errors in your calculations. So any quantum computer must execute operations very quickly, because the longer it takes to perform operations, the greater the risk of losing your information. Precisely when this loss is most likely to occur is a tough nut to crack. There is a kind of “quantum speed limit” on just how fast data can be manipulated. This in turn dictates how powerful the processing power can be in a quantum computer. But it’s incredibly difficult—even for our fastest computer algorithms—to calculate that limit and come up with ways to beat it. That’s where Quantum Moves comes in. When users play the games on the Quantum Moves platform, they are actually solving complex optimization problems: they are figuring out the quantum speed limit and coming up with ingenious ways to break that limit. What makes it challenging is that the atoms don’t like to be stationary. In quantum mechanics, atoms can behave both like particles and waves—flip sides of the same quantum coin, so to speak—and here we are dealing with their wave nature. So they kind of “slosh” around in the wells, like water in a bucket. Players must figure out how to move them quickly, with minimal sloshing, in order to find optimal solutions—a surprisingly challenging task. Sherson admits that the earliest version of the game was a bit lacking in its design; it wasn’t particularly fun to play. That’s why he’s since hired professional game designers to work with his research group to improve the gaming experience, especially for general players with little scientific background. They just launched a new version of Quantum Moves, including mobile apps for the very first time. You can go here to learn more, and download the games for Mac and for PC. 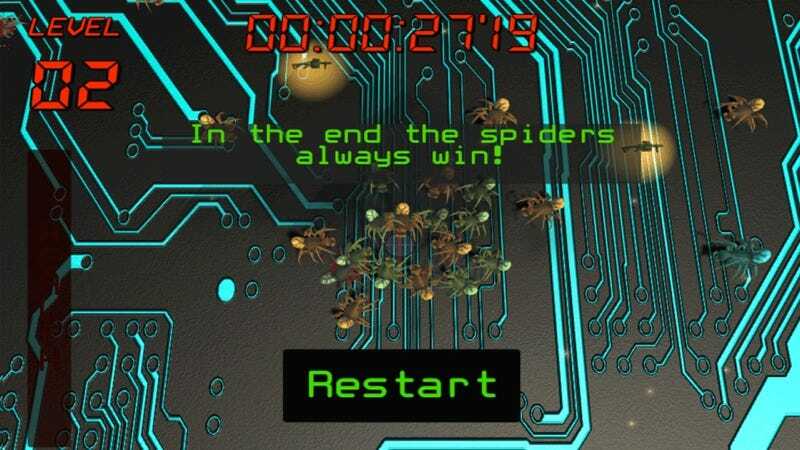 Play an improved version of the BringHomeWater game, or indulge in a bit of target practice against hordes of spiders in Quantum Shooter. There is also a suite of mini-games designed to let the Aarhus group study how people play Tetris, for example, in hopes of learning more about the cognitive skills of the strongest players. The games may look quite different on the surface, but all involve the players intuitively finding optimal solutions for quantum computing. You think you’re playing a game, but you’re actually solving the Schroedinger equation. So maybe it’s premature to throw in the towel when it comes to AI. Perhaps the new supercomputer of the future is us—with a little help from our computer AI friends.